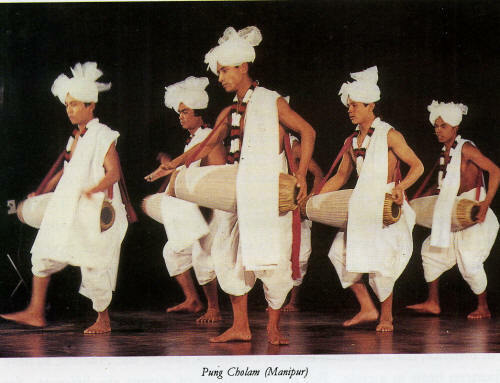 One of the finest example of drum dance is the fascinating Pung Cholam of Manipur. It is a highly sophisticated dance with all the elements of a so called classical dance. Pung is a drum with two faces. One face, usually played with the tight hand, is much smaller than the other. The drum is slung from the neck of the drummer for playing with both the hands. Pung Cholam is performed either solo or in a group. At times, about a hundred drummers perform the dance all wearing spotless white dhoti and white turban. It is then a treat for the eyes, ears, and mind. The aesthetic appeal is so over-powering that it becomes an experience for the life time. While playing intricate rhythmic passages on the drums, the drummers not only dance gracefully and vigorously, but also swings the drum in incredible ways, all the while playing. There ate also acrobatic elements in the dance. Actually, cholam is a generic name of percussion dances prevalent in Manipur: Cholam performed by men are vigorous having acrobatic elements. Those performed by women are delicate and lyrical. The style of dance changes as the percussion instrument changes. Men perform two other drum dances with Dhol and Daph, a frame drum. Men also perform Kartaal Cholam. Kartaal is a pair of large cymbals. The cholams performed by women are not with drums, but with idiophones like clappers and smaller cymbals. Among all the cholams, the Pung Cholam is the best.